Pink may be one of the prettiest color, but when it comes to roses, pink rose signifies deep significance. More so when it comes to love and affection. Are you one of the people who are wondering about its meaning and what it symbolizes? Then this article is especially written for you. The meaning that the pink rose signifies is as stunning as the delicate flower. You may see it in congratulatory bouquets, bridal arrangements, and many other occasions. But what exactly does the rose variety mean? Rose in general is highly regarded as the ultimate symbol of love. This fact alone may perhaps make it an odd choice to those who are unaware. But is that the truth? While pink roses have their own significance, they are incredibly broad in terms of meaning. Unlike red roses which are linked with passionate love, and white roses with purity and marital bond. Pink roses carry a lightweight sense to lighten up the atmosphere. Yes, this lovely colored rose is largely interpreted by many as the ultimate symbol of gentility and grace. An enduring grace and admiration for absolute beauty, pink roses never fail to take our breath away. However, it is worth noting that the meaning may largely depend on the actual hue of the rose in question. Yes, pink rose does come with a wide range of color options. From the light borderline pale hue and medium pink, to darker tones. However in general sense, pink roses are primarily used to express joy and happiness. When given to a love interest, it may mean an innocent love and deep affection. This may later on turn into a deeper, all-consuming love. However, when given to a colleague, it means that the recipient is a pleasant companion with admirable quality. With that said, it’s clear that pink roses also symbolize deep admiration. The significance of this particular blossom may depend on the giver and the intention. However, it also depends of the shades of pink of the rose they give to you. The palest shade of pink typically signifies gentleness and charm. Its light-hearted nature makes it a great choice for those looking for a symbol for their young love. 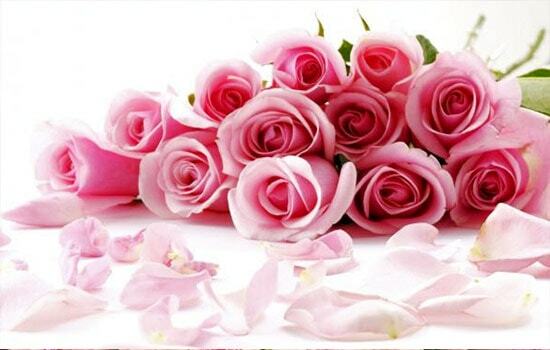 Pink roses with medium shade of pink may signify admiration and expression of sympathy. If you are looking for rose arrangement to show sympathy, you cannot go wrong with a bouquet of pink roses. Their delicate appearance and charming visual appeal never fail to deliver warmth and heart-felt gesture. Additionally, young couples may use it to signify the beginning of their gentle, newly formed romance. As for darker shades of pink roses, this option signifies pride and deep gratitude. The poetic romance of sweetness and gentleness are linked with pink roses. But that doesn’t mean you cannot use this particular blossom for other purposes. Simply because this rose is a traditional choice for those wanting to say thank you. With the right shade of pink roses and understanding on what each pink rose signifies, you’re bound to find the one.